Let’s spotlight the progression of four key players with Bethlehem Steel, two signed to the USL club and two on loan from Philadelphia Union. Consider Bolu Akinyode, Bethlehem Steel’s starting center defensive midfielder, or No. 6. In the two games since he missed going to Toronto due to “paperwork” problems, Bolu Akinyode has stepped up his game. He seems to have risen above the previous level that had characterized his play and climbed to the one above it. Both range and endurance have increased. Judgement of when to shield and when to attack has been more deft. Improvement at the No. 6 enables the No. 8 to be more adventuresome, and Akinyode’s recent play has made it safer for No. 8 center midfielder Derrick Jones to attack further up the field more frequently. Pittsburgh is not playing well recently, but Wilmington has been playing well and has a solid, dangerous attacking In both the Pittsburgh and Wilmington home shutout wins, Akinyode defeated many attacks before they penetrated to the backs. Two games only begins a trend. But Akinyode the ball-winner has been more efficiently destructive, while Akinyode the creator has demonstrated tighter ball control and been faster and smarter distributing it. He’s also the team leader in “snake bite” on the pitch. The snake bite does not connect to Ireland and St. Patrick even though Chambers is Irish. But, if “struck posts” were a kept offensive statistic, Chambers would certainly lead the team and possibly the league. The most recent clang sounded off a gorgeous free kick pass wonderfully struck in the first half against Wilmington last Thursday in Bethlehem. One of these days, one will go in. Chambers has also demonstrated his soccer intelligence by significantly cutting the number of bookings he has received — he was leading the league at one point — functioning as a box-to-box midfielder despite his pedestrian pace. That means both excellent conditioning and shrewd, experienced brains. Next consider Taylor Washington, the Steel starting left back consistently on loan from Philadelphia Union. He has just been paid the compliment of his 45 minutes on the pitch against Crystal Palace last Wednesday. At the end of preseason against Georgetown University’s spring side, he and Walter Restrepo suffered badly by comparison with Richter and Eric Ayuk. The strength on the right highlighted the weakness on the left. That has changed. Washington has stepped up his game significantly. Burke himself has complimented the energy now on display. Not only is there energy, but there is confidence handling the ball. Defending opposition attackers are sidestepped. Head balls are won against taller opponents on better timing and superior lift. Crosses are delivered. Overlaps are run and well timed. Against Pittsburgh at Goodman in what Burke called possibly the best half of soccer for the season, the Steel attack consistently began with Washington in the left channel, finding Cole Missimo and a rotating central midfielder to triangle through the defense onto that offensive flank, from which early crosses went in toward Corey Burke and Leo Fernandes. Sometimes the cross came from Washington, sometimes from Missimo, and occasionally from one of the center midfielders cycled out wide. 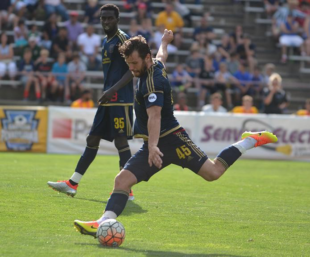 The pattern repeated consistently, and it dominated the Riverhounds. If the trend continues, Union left back Fabinho may feel pressure next January. If. Last, consider Cole Missimo. His opportunities have come later than the first three, since he ranked behind Restrepo on the first team’s priority list. Early this season, Missimo usually came on for Restrepo when the diminutive winger tired. Now, with the small speed merchant improved enough to enter the first team’s 18, the taller and younger flank Massimo is getting some starts. Other than a preseason goal against Chicago, Missimo had shown little for much of the year. While workmanlike and basic, there was more creative flair and assertive confidence behind him on the Steel’s own bench. Had the scouts goofed? We may have had too little faith. It has not been an explosive, meteor-like transformation. But as Missimo has figured out the new system, the new professional way of being as a soccer player, the spark that somebody has begun to reveal itself. Hours of touches on the ball, mentioned without emphasis during a wide-ranging interview elsewhere, seem to be having an effect. Missimo himself underplayed his nutmeg of an English Premier League sometime starter, Connor Wickham, against Crystal Palace, saying he had had no other choice. But the Russians have a proverb, that repetition is the mother of learning. It has taught the uncertain rookie the overall system. He understands his role’s execution. Whether fluke or indicator, with no other choice he beat a Premier League player. And his roles in the destruction of Pittsburgh and the defeat of Wilmington were solidly, competently essential. We may be starting to see his potential. Author: Tim Jones Still learning soccer after four decades. A southwestern Ohio buckeye transplanted to Chester County. Loves history, new ideas, baking bread, being a sports fan, and apparently unconnected connections. Though he wouldn't tell you, the PSP crew wants you to know he's a retired high school soccer coach. Does anyone have the ages for these guys? Particularly Akinyode. I know Austin Trusty is the young prospect ready for a professional career coming out of the academy and that Missimo and Washington are NCAA products.